"Blessed be the Lord, that hath given rest unto his people Israel, according to all that he promised: there hath not failed one word of all his good promise, which he promised by the hand of Moses his servant." I Kings 8:56 Look at the record and leave the rest to Him. He will keep His Word with you. We are but to claim it. "And Joseph said unto them, Fear not: for am I in the place of God? But as for you, ye thought evil against me; but God meant it unto good, to bring to pass, as it is this day, to save much people alive." Genesis 50:19,20 God has a way of taking what seems to be a big mistake and making a great miracle out of it. As for us, we are inclined to get disappointments and appointments mixed up. Walk away from your problem and let God work on the answer. When you see what He comes up with, you will be glad you didn't try to work it out. "That thy trust may be in the Lord, I have made known to thee this day, even to thee. Have not I written to thee excellent things in counsels and knowledge." Proverbs 22:19,20 Life's answers are lost to us because we keep leaning on our own understanding or taking the advice of those who are as much in the dark as we are. Read the Bible every day and apply it to your everyday need. "...Thou hast made the heaven and the earth by thy great power...and there is nothing too hard for thee." Jeremiah 32:17 If He can make the heaven and the earth, you surely can trust Him with your problem. Believe that. He is great enough and willing to meet your every need. "All power is given unto me in Heaven and in earth." "Trust ye in the Lord forever: for in the Lord JEHOVAH is everlasting strength." Isaiah 26:4 Enlist your life in the service of the Lord forever. Don't worry about the "holding out," for in Him is "everlasting strength." "I will uphold thee with the right hand of my righteousness." "Have faith in God." "But without faith it is impossible to please him: for he that cometh to God must believe that he is, and that he is a rewarder of them that diligently seek him." Hebrews 11:6 Nothing that we can do for God can ever take the place of our trust in Him. 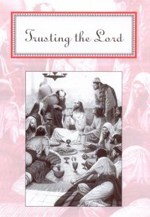 It is altogether possible to be a tireless worker for the Lord and, yet, to be timid in our trust. "Unto thee, O Lord, I lift up my soul...I trust in thee..." Psalm 25:1,2 The man who lifts the burdens of life to God in sincerity will never be let down. "He careth for you." "Thus saith the Lord, thy Redeemer, the Holy One of Israel; I am the Lord thy God which teacheth thee to profit, which leadeth thee by the way that thou shouldest go." Isaiah 48:17 Don't hesitate to ask God for guidance. Don't question the way He leads. He will guide you into all truth. "But it is good for me to draw near to God: I have put my trust in the Lord God, that I may declare all thy works." Psalm 73:28 Our greatest need is to be near to God. All else that is good and worthwhile will follow. "Draw nigh to God, and he will draw nigh to you." "And Jesus looking upon them saith, With men it is impossible, but not with God: for with God all things are possible." St. Mark 10:27 You have tried everything else, why not try God? He is able to do and undo, and is limited only by what we will believe Him for. "I am the Lord, I change not." "And it is easier for heaven and earth to pass, than one tittle of the law to fail." St. Luke 16:17 The Lord has never been known to go back on His Word or back down on His promises. "Only believe." "What time I am afraid, I will trust in thee." Psalm 56:3 If fear overtakes you, hurry to your Heavenly Father. He loves you and has the answer for every problem. "My covenant will I not break, nor alter the thing that is gone out of my lips." Psalm 89:34 In an age of broken promises, God stands ready to keep His Word with the humblest believer. "What time I am afraid, I will trust in thee." Psalm 56:3 When we treat fear with trust, all the terrors of life must go. "I will never leave thee nor forsake thee." "Behold, I will do a new thing; now it shall spring forth; shall ye not know it? I will even make a way in the wilderness, and rivers in the desert." Isaiah 43:19 We serve a creative God whose power adjusts to every problem of life. He will walk you through your wilderness, making a way where there is no way. Trust Him. "And the Lord shall help them, and deliver them: he shall deliver them from the wicked, and save them, because they trust in him." Psalm 37:40 The Lord is in the deliverance business. Special delivery! "Behold, I am the Lord, the God of all flesh: is there anything too hard for me."